The work of B.W. Powe invites mindfulness. The man is oceanic—in intellectual breadth and interest, spiritual vision, and in pure unshielded feeling. Powe crosses genres. He’s billed as a philosopher, poet, scholar, and novelist. He calls himself a neo-romantic, hyper-modern transcendentalist, and the mouthful fits. 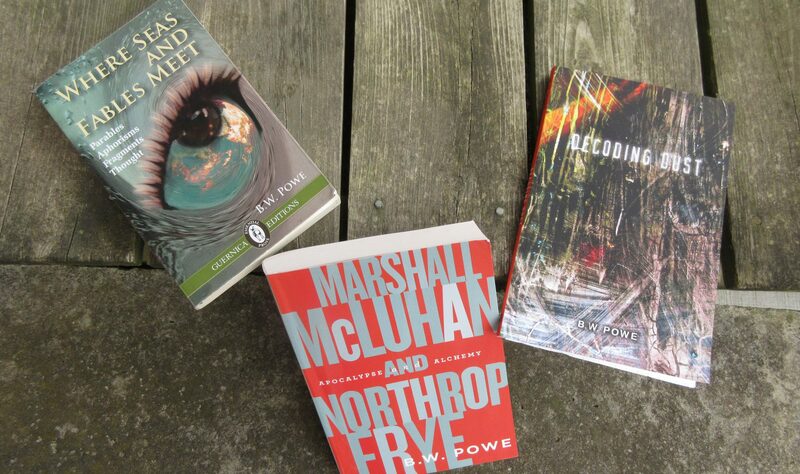 An early student of Marshall McLuhan, he’s as at-home in the wired world of global connectivity and vibrational ESP as he is in a clearing in the woods in the pages of a fable; as concerned with spirit-journey as with the journey of body and mind. I encountered Powe the poet first—in two emotive poems that appeared in Exile Quarterly. What struck me: no man in Canada is writing this kind of rapturous, self-revealing, un-ironic lyric. I wanted to read more. The two Exile pieces reappeared in his first poetry collection, The Unsaid Passing (Guernica Editions, 2005), among other unabashedly passionate, heartfelt poems. 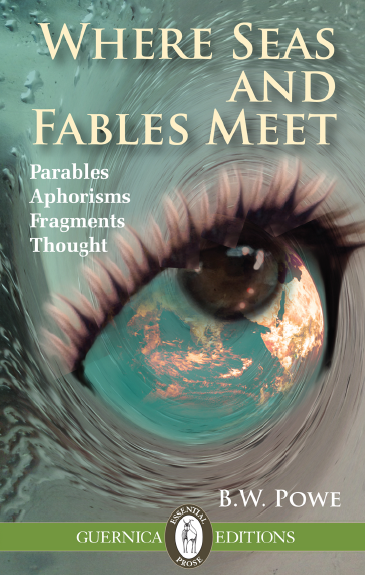 Powe’s newest release, Where Seas and Fables Meet: Parables, Aphorisms, Fragments, Thought (Guernica Editions, 2015), soars out from his earlier collection like a third-eye on fire. Open the book like bibliomant, eyes closed, and pick a passage. There will be riches. Powe draws broadly—on Baudelaire, Bachelard, Canetti, and Sappho. Neruda, Nin, Beckett, and Joyce. Proust, Jung, Rilke, Anne Carson. Kafka, Kafka, Kafka, and so many others. The short, eclectic pieces bear titles like “Living in New Beginnings,” “Grace,” “The Library of Mysteries,” “Mystic,” “Affirmations,” “Loving Destiny,” “Signs,” “Soul Veils,” “Re-visions,” “A Lantern Mind,” and “Vibration-Beings.” They feel oracular. One name that doesn’t come up is William Irwin Thompson, though it could. Reading Where Seas and Fables Meet brought me back to my graduate days at York University, circa 1982. As I was walking through Central Square on the way to Scott Library, a title in the bookstore caught my eye: The Time Falling Bodies Take to Light. Royal blue cover, golden lettering—centered and descending into an image of William Blake’s engraving of “The reunion of the soul and the body.” I had no idea who Thompson was and no funds to spare, but I went in and made the purchase anyway. That might have been the first time I consciously bought a book for its title and cover design. At the time, I was reading things like Rational Decision-Making by Janice Stein, Power, Influence and Authority by David Bell, Canada as a Principal Power by David Dewitt and John Kirton, and translated pages from Antonio Gramsci’s Prison Notebooks for a course on Italian communism. William Irwin Thompson’s Time Falling Bodies was an axe. There’s a line in Powe’s Seas and Fables that hits it: “Some books crack you open so that you’re the one who’s read.” Back in 1982, I felt cracked open by Thompson—opened and disclosed. Thompson was talking about the decline of the militarized nation-state, an emergent planetary culture, the resacralization of art—to embrace myth, mysticism, and the suppressed feminine. He was advocating the recall of universal vision in religion, cultural regeneration, cross-fertilization of science, religion, and art. Anarchic freedom of expression. It was grand and heady stuff and made for much more evocative reading than Canada as a Principal Power and Rational Decision-Making. But I stuck with the latter, at least for a few more years. Then poetry and art prevailed—a kind of creativity that felt more vital, soulful, and true to life. Reading Powe now calls up soulfulness anew. In Powe power comes from candour and ardour. And spirit/light—imagination. There’s hopefulness for growth toward a “world-soul”—emerging from the personal “in a cosmos created by love.” In Powe it’s the impersonal that imprisons: any kind of tyrannical “Structure,” and “monstrousness that comes from looking down on our desire to love and be respected.” The “critic” Powe has yielded to Powe the lover; a younger man’s “attack”-mode to a mid-life writer’s gratitude—for beauty already extant and wisdom potentially present: “Now [as] perpetual destination.” It may be idealized, but there’s a truthfulness in Seas I want to glean from and believe. This entry was posted in Sin categoría on 13 October, 2015 by bwpowe.